At Card Not Present®, continuous dialogue with our community has given us a unique perspective on the payments and fraud issues that affect the entire range of online merchants. Each quarter, in cooperation with a partner, The CNP Review will examine one aspect of our world in four in-depth pieces covering the trends and challenges driving that issue. 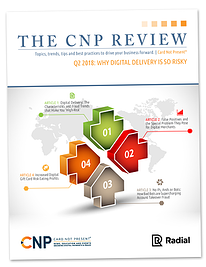 Our Q2 2018 edition of the CNP Review looks at the increased risk of digital delivery. Airline tickets, music, gift cards, games, hotel reservations and more can all be purchased online and received in digital form. But the convenience of instant delivery comes at a price: increased risk of fraud. The inaugural CNP Review examines some of the recent issues facing merchants in these verticals and some practical ideas to mitigate those elevated risks.